Eila Mell is a journalist who has spent many years writing about fashion, theater, and film and interviewing some of the biggest names in the fashion and entertainment industries. She has been tapped for her expertise by nearly a hundred television and radio shows, including The Insider, Hollywood 411, Dailies and The Mark & Brian Show. 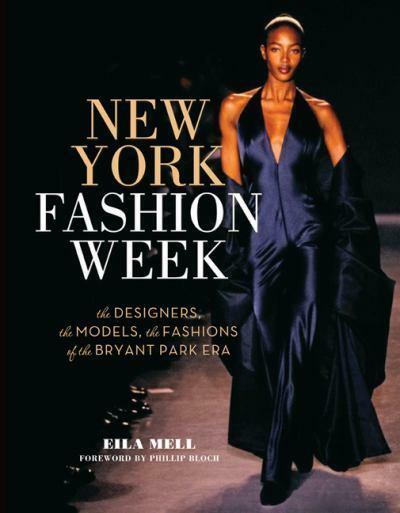 Eila was gracious enough to grant Emily Sandberg and I access to her views on the fashion industry for the launch of her new book New York Fashion Week. What inspired you to document almost two decades of NYC Fashion Week history? I was invited to attend a few shows during Fashion Week while working on a project. When I casually mentioned it to friends (mostly people with no interest in fashion) everyone wanted to go with me! I quickly realized that people wanted to know what was going on in the tents. What challenges did you experience during the process of writing the book? Editing was the biggest challenge. There was so much information and so many photos it was hard to get the book down to 368 pages. Fern Mallis is largely credited with creating NYC Fashion Week as we know it. What impact, if any, do you see on fashion week now Fern has stepped down? Fern Mallis was the face and voice of Fashion Week. There is no one person now that represents the entire event. Since Fern’s departure the shows have moved from Bryant Park to Lincoln Center, marking the end of an era. The cost of staging a runway show can easily run into the hundreds of thousands of dollars. In a Web 2.0 world, do you think the traditional staging of runway shows is still necessary and economically advantageous? That’s a hard one. On one hand, an enormous amount of money could be saved if designers recorded shows and sent them to the people who need to see them. However, that will never compare to seeing a live runway show. There is a huge advantage to actually seeing the clothes move in person that a recording cannot replicate. How do you see the internet and social media changing the way fashion is presented and delivered to the public. Because of the internet and social media fashion is now open to everyone. In 1993 it didn’t seem possible that a 12 year old girl from Illinois could post her insights online and become part of the industry. Anyone can be a critic. Another major change is the speed at which fashion is presented to the public. It used to be that the few invited guests were getting a preview of what the world would see months later. Now the second a look comes down the runway it’s being tweeted. Things are very different. What role, if any, do you think sponsorship has over what designers present? Hopefully not much. I think it’s important that designers have creative freedom. The vision of the four major fashion conglomorates; LVMH, Gucci Group, Richemont and Prada decide and set the tone of fashion for the majority of the world. Discuss. It’s an interesting issue. The designers who work for these companies are some of the most talented in the industry, so perhaps it’s fitting. But there should always be room for the smaller labels and new designers who have their own vision. Bloggers such as Tavi Gevinson have an increasing presence at runway shows. What role do you see bloggers having in the future? Bloggers have huge followings, and that can’t be ignored. I don’t think they’re going away anytime soon. I think that blogging has the potential to rival magazines, as the number of people getting their fashion scoops online continues to grow. How do you feel about the democratization of fashion? For me, some of the most interesting looks have always been found in street fashion. People should embrace their individuality and not worry about rules! How has writing affected your ability to communicate in the world? Writing can be such a solitary endeavor. It’s an amazing thing when you finally share your work with the world. When someone really gets what you’ve written about, it’s priceless. You have a distinct writing voice. Can you tell us how it was developed and what the process of finding that voice was like for you? I just try to have a conversation with my readers. I tend to write the way I speak, which can be very direct. I write about what I love, and know that there are so many others with the same passion. How many people would love to go to New York Fashion Week? My goal is to give those people the lowdown on what it’s like to be there almost as if we were discussing it over coffee. It can be so much fun dishing with friends, and I try to bring that same quality to my work.